When one homeowner in Somerville grew tired of their rotting wooden deck, they decided it was time to invest in a new one, made with a material that would last longer. They reached out to us for advice in deciding which material would be best for them. 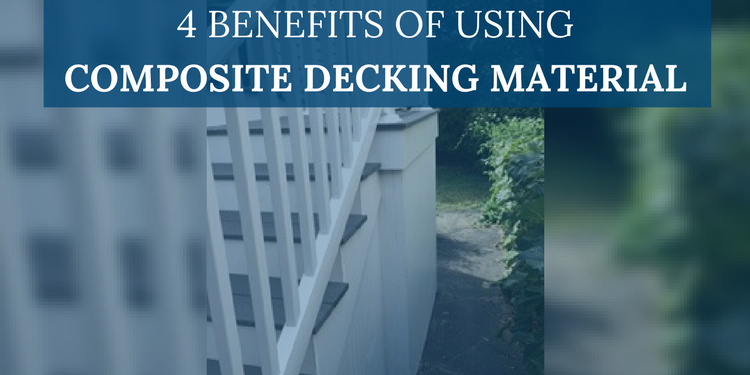 While there are many options when it comes to decking, we decided that the benefits of composite decking material made it the right choice for this home renovation project. There are several different types of decking materials to choose from when doing a project like this. While wood is the traditional building material of choice, composite decking is becoming a more popular choice. Composite is a combination of recycled materials, such as plastic, wood chips, sawdust, or even bamboo. It often looks like wood but feels much more like plastic. It is a lightweight and stain resistant material, which makes it perfect for outdoor use. Environmentally friendly: Composite decking is made of recycled materials, which makes it the right choice for eco-friendly renovators! Weather resistant: Composite material resists damage from the sun, wind, and rain. When your decking resists the elements, it is also less susceptible to splintering and rot and will have a much longer life. Pest free: Wooden decking material can be invaded by pests unless it is infused with pesticides. The trouble is that these pesticides can be dangerous to children or pets who spend time on the deck! Composite material naturally resists pests, so you’ll have more peace of mind. Low maintenance: While wooden decks need proper maintenance to prevent splintering and rot, a composite material is much more resistant to these problems, which means less maintenance work for you. And while wooden decks often need to be repainted, composite decking is made in a variety of colors and is fade resistant! After comparing their decking options, it was clear for this homeowner that the advantages of composite decking made it the right material for their new deck. Do you have decking or other general contracting questions? Mason Sky can help. Schedule your free consultation today.